Hey there stamping friends! Welcome, welcome, welcome. It's is time for a new challenge over at Just Add Ink #443 | Just Add Two. It's a fun Just Add Two Challenge. Choose two from either embossing past, colouring or sequins. If you've followed my blog for a while you would probably have thought that I would have chosen colouring. I do love my colouring but I didn't choose it this time. I did choose sequins, that of course was a given and I also chose Embossing Paste. I don't tend to use the embossing paste that much and wanted to create with it today. I actually made my stencil for the embossing paste using the largest die from the Doily Builder Thinlits. I used a scrap piece of cardstock, ran the die through the Big Shot and then once cut used that piece as the stencil for the embossing paste. I love the white embossing paste on the Shimmery White Cardstock for a classic white on white look. 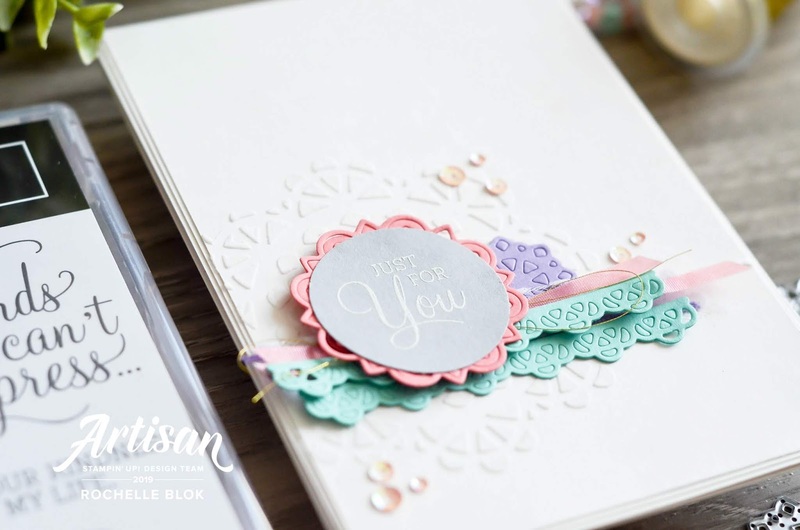 Id you wanted to step up the look of the base you could use the Shimmery Embossing Paste or even the Silver or even still colour the embossing paste with the Stampin' Up! Re-inkers. 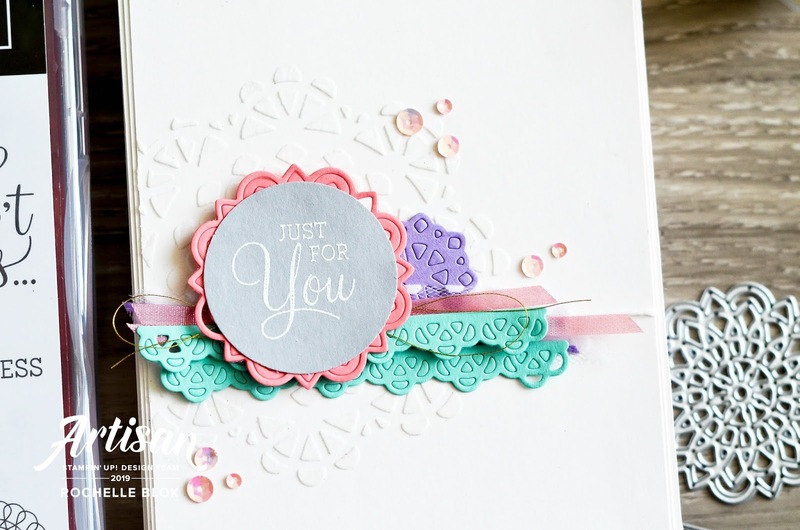 The other die cut pieces layered on the card also come from the Doily Builder Thinlits. How gorgeous are the fun, intricate details on each of the die cut pieces? I love the little pops of colour against the white background and how fun are those colours together. Teamed up with the embossing paste and the doily layers are the Powder Pink sequins from the Iridescent Sequin Assortment. Why not try using other Framelits or Thinlits to make your own stencils/masks to use with embossing paste? You'll be able to make your own custom embossing stencils to customise your creations. 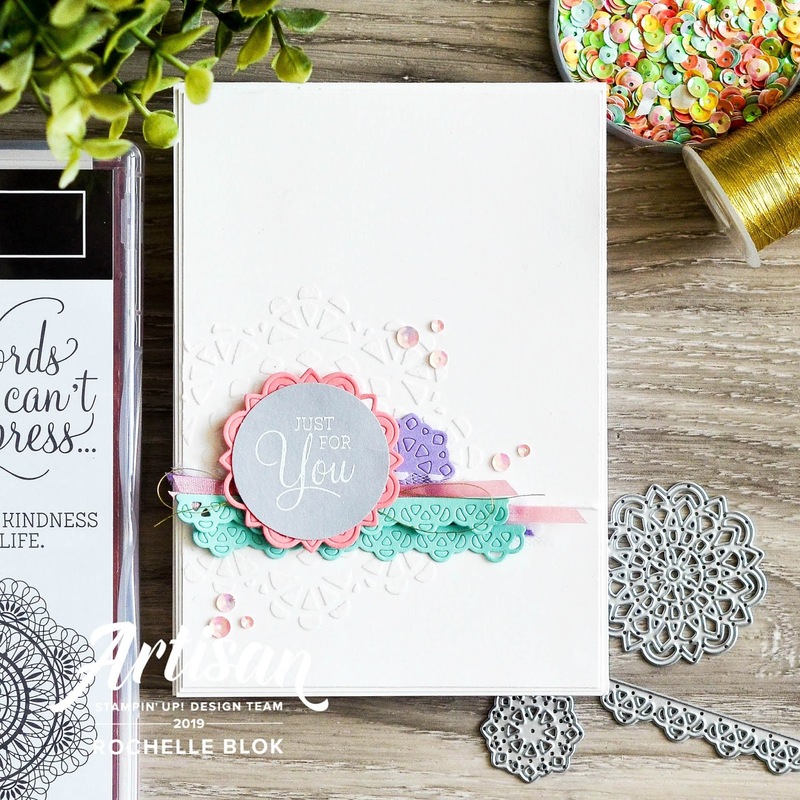 There are lot of amazing creations from the Just Add Ink Design Team on the JAI Blog. Go and check out to see what 'two' they all chose for their creations this week and then while your there see how you can enter your creation. Can't wait to see what 'two' you choose. Awesome card! Your layering is, as always, perfect! The colours are so pretty together.